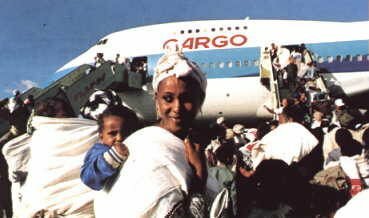 Operation Solomon - Operation Solomon is the name given to the airlift of over 14,000 Ethiopian Jews ("Falasha" or "Beta Israel") to Israel in 1991. Previously, relatviely small numbers of Ethiopian Jews had been able to leave the country in Operations Moses and Joshua, but media leaks forced the end of the secret Aliya programs in 1985, and only a trickle of Ethiopian Jews were able to enter Israel in subsequent years. However, by 1990 it was apparent that the Marxist regime of Haile Mengistu was near collapse. In November 1990, Ethiopia and Israel reached an agreement that would allow Ethiopian Jews to move to Israel under the context of family reunification. It soon became clear that the Ethiopian government was willing to allow immigration to Israel beyond the original framework of reunification. In early 1991, rebel forces began to concentrate efforts to overthrow the government of Ethiopia. By early May, Ethiopian strongman Haile Mengistu Mariam had fled his country. Rebels claimed control of the capital city, Addis Ababa. Israel had perceived the worsening situation and made plans for an air-lift. Generous bribes and help in obtaining asylum for members of the dying regime made the airlift possible. Boarding El-Al Cargo aircraft during Operation Solomon. The Israeli government allowed El Al, the Israeli national carrier, to fly on the Jewish Sabbath. In what would become one of the quickest and most amazing rescue efforts in history, the State of Israel launched Operation Solomon to rescue the remaining Ethiopian Jews. Timing was critical since there were no guarantees that the rebel forces would not change their minds and use the Ethiopian Jews as bargaining tools with Israel or the United States. The mission began on Friday, May 24 and continued for 36 straight hours. A total of 34 to 36 flights by El Al jumbo jets and IAF Hercules C-130 transport planes brought the bulk of the remaining Beta Israel to Israel. The aircraft brought a total of 14,325 passengers to Israel. On May 24, 1991, a single Boeing 747 carried 1,122 passengers from Sudan to Israel. It was planned to have carried 760 passengers, but the malnourished refugees were under weight. Only 1,087 passengers were allowed on the plane officially, but additional children had been hidden under their mothers' dresses. Substantial numbers of Jews nonetheless remained in Ethiopia. Over 39,000 Ethiopian Jews arrived between 1990 and 1999, but Falash Mura, Ethiopian Jews who had been forcibly converted to Christianity, still remained in Ethiopia and are still (2009) being brought out. In fact, it seems that the first Falash Mura got to Israel by sealth in Operation Solomon.